No Man’s Sky Beyond brings PS VR support to the entire game when it launches as a free update this summer. Hello, everyone! We’re excited to be able to tell you more about No Man’s Sky: Beyond, a major free update coming in Summer 2019 and the next big chapter in our journey. Grab the joystick and thruster to fly your starship over an unexplored alien planet as you peer out of the cockpit at the view below. Reach into your backpack to grab your multitool, touch it to switch to terrain manipulation, and carve out intricate shapes with unprecedented control. Play in multiplayer and casually wave to your non-VR friends or fist bump your PS VR peers. No Man’s Sky VR, like all the parts of Beyond, will be free to existing players. By bringing full VR support, for free, to the millions of players already playing the game, No Man’s Sky will become perhaps the most-owned VR title when released. This amazes us, and is utterly humbling. The team is working so hard to live up to the expectations that creates. 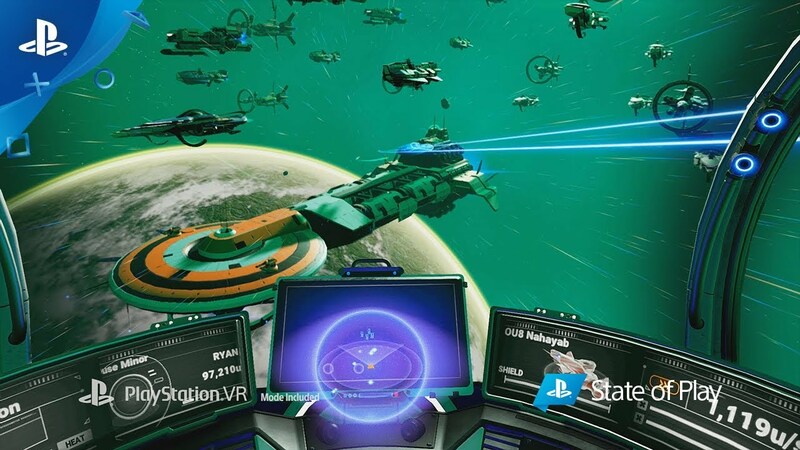 We are excited for that moment when millions of players will suddenly update and be able to set foot on their home planets and explore the intricate bases they have built in virtual reality for the first time. Learn more about No Man’s Sky Online, the dramatically improved multiplayer component of No Man’s Sky Beyond. Only downside for me in this is the immersion breaking lack of full body like Farpoint has. As seen in the hand at 0:02﻿. Otherwise, this is EVERYTHING I WANTED WHEN PSVR WAS FIRST ANNOUNCED!!!! WOOOOOOO I’m excited for this. Feel the color pallet will work amazingly well in VR. Been enjoying NMS since day 1 though admittedly don’t play it nearly as much as I used to. But with VR support coming….farewell real world! Excited to hear what this third big thing is going to be. Taming of creatures to be our pets maybe? Crafting our own multi-tool/ships? A base that doesn’t keep filling up with dirt I already mined? Either way, looking forward to it! I finally have a reason to reinstall this after the initial disappointment years ago. Looking forward to starting from scratch with a new perspective. Thank you Sean and everyone at Hello Games. I’m re-installing 2 and 1/2 years later and will be there day 1. Every update has made this game better, and now VR? I’ve been wanting this since before I HAD VR. Thank you for continuing to support your community. Can’t wait to jump back in! This is amazing. I bought this game on my decent PC rig a week before release and enjoyed it (with a few detractors) since then. I’ve loved it with all of the expansive updates that the game has received. But I sold my PC a few months ago to help pay for peripherals in anticipation of Dreams; one of those being a PSVR headset. I am now so glad that this game is getting this update and will allow us all to explore in VR. I’ve been thinking of buying No Man’s Sky on PS4 just because I miss the game, but now with VR support coming, it may be a must-buy now! Thank you Hello Games! Games like this will hopefully push other developers like yourself towards what is a brilliant piece of gaming hardware. I will be buying! Vita isn’t a throwaway. Uncharted GA, Tearaway, Killzone Merc, P4G, LBP Vita, Oreshika, Severed, Gravity Rush, Soul Sac, Zero Escape, Freedom Wars, AC Liberation, Arkham Origins Blackgate, Dokuro, Super Stardust Delta, DQ Builders, Salt n Sanctuary, Axiom Verge, World of Final Fantasy, FFX/X2, SFxTekken, MvC3 ect. will this need move controllers or is the standard dual shock good enough? You should get the move controllers either way. YEEEEEAAAAAH!!! Thank you Sean Murray and SONY!! And to think I was lamenting that Elite Dangerous has PC VR but not PS VR. Oh man, such great news! This is huge to me and many many thanks to Hello games for doing it. The chance to walk around my Base and to see planets in space in life sized glory is nothing short of Amazing! I’m sure this will be my all time most played VR game. Sony, if you drop PSVR2 in time im all over it. If not, its Rift or Vive. Id rather be with you. No Man’s Sky is a great adventure game! To game developers: Are you able to add more options to lower game brightness (particularly for the environments)? I lowered the brightness settings the last time I played this game, and I still found some of the environments to be hard on the eyes. Thank you. This is what I have been waiting for to jump back into No Man’s Sky. Can’t thank you enough for bring PSVR support to this title. Really wish their was a way to throw a few bones your way to help support this.